If you search for information about how to create a storyboard you will find all kinds of interesting pieces of advice, from those that recommend you learn how to draw before you begin, to those that talk about how to tell a story, to those that list mathematical formulations for determining expansion and contraction of aspect ratio for various media including cropping to comply with 1980’s television standards, which I found quite fascinating, even if a bit superfluous. I suppose each of these articles has its place and it’s own audience, but I was searching for a concise article for illustrators about executing a conceptualized TV spot and illustrating it. Something that got right to the point with the all the details needed without many unnecessary ones. For us illustrators, the ability to draw or to create a visual narrative comes naturally, it’s what makes us illustrators, but many of us, even though we are quite practiced in creating individual illustrations for print and for the web, may be unfamiliar with concept presentation for a non-static media—in this instance TV commercials. When conceptualizing and illustrating a TV commercial it is important to be aware that storyboards are used for several purposes: 1) Selling a concept to a client. 2) Providing a visual guide for the production crew, i.e., a director, cinematographer, sound person, stylist, editor, etc. 3) Assisting in the determination and procurement of a budget. 4) Supplying reference for casting decisions. 5) Test marketing to focus groups and potential audiences. A single storyboard concept may appear in front of all of these different viewers, from an executive producer, to an account executive, to a location scout, and even to a mother and her children. Film and video professionals refer to the picture plane as the aspect ratio of the media frame, but what it is to an illustrator or storyboard artist is the compositional space the visual appears in; and there are no portrait formats here, only landscape ones. There are several different proportional formats that have been in use over the past 100 years, but since we are mainly concerned with TV spots it is not necessary to review all of them. (Incidentally, as new smart devices come on line these proportional formats are still changing and evolving). But lets focus on TV. If we were conceptualizing a storyboard back in the 1980’s or even 90’s we would be using a 4:3 format ratio. You see this proportion all the time when you watch classic movies on TBS or old television series on TV Land. However, most TV‘s now are formatted for a 16:9 ratio. So our picture plane should be 16:9 in proportion. An equivalent storyboard frame would be 4” x 2.25”, quite a bit wider than its 4” x 3” predecessor, and a bit narrower than the 1960's Cinemascope, which would be 4” x 1.75”. So now that the format for a storyboard has been discussed, let's look at the story it will contain. What will be significant here is not the story itself, or a particular type of story, but how to portray it. Consider that from the concept illustrator’s standpoint, the story, or storyboard, is not only drawn for an audience, but rather for a client, producer, or a production company. Therefore, a certain type of visual language is to be used—a language that can be interpreted by other creative people and visual professionals, and can be explained to clients. Think of a storyboard as being a form of visual “shorthand” for a series of visual events that will occur over time. It could be five seconds, 45 seconds, or longer. Now bear in mind, presently, media placement for a 30 second spot during prime time is as high as $326,260, and averages around $100,000. Definitely, high stakes! But where it all begins is with a storyboard of concept sketches. The storyboard artist is the visionary, with the storyboard art being the vision. A TV commercial concept is first presented as a storyboard, which is a series of individual frames that are usually arranged in a grid. The story begins with the top row left frame and proceeds across, it continues in the next row down left frame, and continues accordingly. There is no set amount of frames to be drawn. The number is determined by the content of the commercial, the vision of the artist, and the visual techniques that are to be suggested. However, there are some rules to be observed. A storyboard should be as thorough as it has to be to visualize a TV spot, and at the same time as concise as possible for presentation purposes. The concept must be clear so it can be presented quickly and efficiently to both a visually, and non-visually educated audience. Content is where storyboard, book, graphic novel, comic, and editorial illustration share some similarities. All rely on the illustrator to visualize a story—to interpret the characters, provide the settings, compose the scenes, determine the points of view, and suggest the objects to be included to bring the story to life. The main differences are in the application of the illustrations. A storyboard is not afinished work of art. First, it is primarily a plan or blueprint, much the same as a sketch is to a final illustration, or a study is to a painting. And second, it is produced as a reference for a time-based media, be it a film, an animation, or a TV commercial. 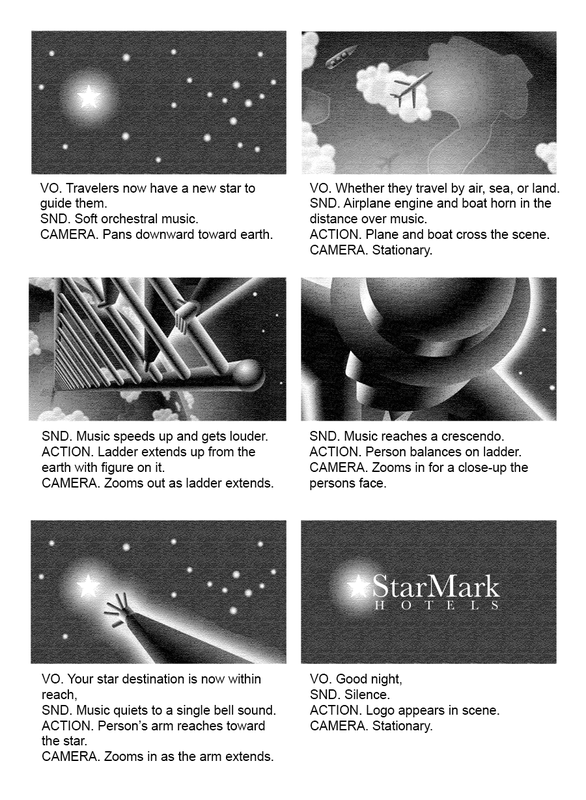 A storyboard contains text that describes elements of the TV spot which the visual is incapable of showing, e.g., the dialog. The dialog is the spoken word that occurs in the commercial. If it is stated by characters, they are attributed to it, if it is a “voice over” announcer then that is noted, usually indicated with a prefix of V.O. The dialog is notated in the same fashion as it would appear as in play. Here is an example is from Shakespeare’s The Tragedy of Hamlet, Prince of Denmark that would work appropriately in a storyboard. Marcellus: Peace, break thee off; look, where it comes again! Bernardo: In the same figure, like the king that's dead. Marcellus: Thou art a scholar; speak to it, Horatio. Bernardo: Looks it not like the king? Mark it, Horatio. An announcer is defined as a person who is not a character within a story. Only their voice can be heard. The announcer’s dialog is voiced over the visuals, characters, and story. Here is an example of voice over text, i.e., what an announcer would say during the scene. The following might accompany the character dialog of Marcellus and Bernardo. VO: These days we no longer use Middle English to make funeral arrangements for our loved ones. At the Daulaz Funeral home our sympathy for your bereavement is clear. Ad agencies coined a term for an announcer who also appeared on camera, as a talking head. Usually a person meant to be a non-actor, who is explaining or endorsing the product or some information in the commercial to the audience in a direct manner. The talking head reference comes from early live television where the person would only be presented from the shoulders on up talking to an audience, thus a talking head. No matter how talented an illustrator is, a static storyboard frame can only suggest motion and camera movement. This is where descriptive text comes in. Phases such as camera zooms in, pan left, soft focus, dissolve, etc., are stated below each frame along with the dialog and sound track information. Here are some examples. EDIT: Jump cut from full face to close up. SND: Loud drumming in background. So now we come to the illustrator/storyboard artist's task. Create a storyboard of a TV commercial to present for story visualization, review, conceptual approval, and production guidance. Rule 1. Begin with the proper aspect ratio (proportion of the scenes) required. The content and composition of each scene is of the utmost importance from corner to corner, so establish the right frame dimensions before beginning to sketch. It will be a waist time to have to have to redraw the entire storyboard to add width to the scenes or to crop them. Rule 2. Use as few frames as possible to tell the story. There is no need to make a storyboard unnecessarily complicated. Although it is being created for a motion-based media, it does not need to function like one. In other words, the frames don’t have to be repetitious or to simulate a flipbook for instance. Rule 3. Have each frame represent a single scene. If several actions occur within a scene they can be described rather than drawn as separate individual frames. For example, if a conversation occurs within a scene, but the camera angle doesn’t change significantly, than the scene can be rendered in one frame, with the dialog exchange occurring in a text section below on the storyboard. Rule 4. Display the product logo or positioning statement as a separate frame. Even if a theme line is superimposed over a cinematic frame it should be represented in an additional frame in the storyboard. Also each typographical statement that appear on screen should be a separate frame of what will be seen, with how the text will appear. Rule 5. Begin and conclude the story properly. Include elements that should appear in the beginning and ending frames for the storyboard. It is customary for the product, sponsor, positioning statement, or logo to be displayed at some point during a TV commercial. This happens at the beginning at a commercial occasionally, but more often at the end, to leave a viewer with the identity of the commercial’s sponsor.